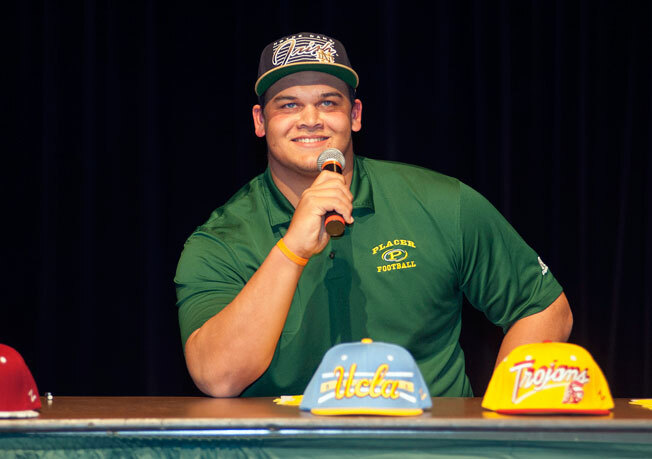 Eddie Vanderdoes signed the worst contract in American sports. Now, he'll pay for that signature with a year of college eligibility. He'll also learn a valuable lesson about leverage that has nothing to do with pad level along the line of scrimmage. Vanderdoes, a 310-pound defensive tackle from Auburn, Calif., signed a National Letter of Intent on Feb. 6 pledging to attend Notre Dame. Vanderdoes wasn't alone; thousands of other young athletes sign the same document every year. But Vanderdoes was one of the few who changed his mind. Recently, something shifted and Vanderdoes decided he needed to attend UCLA, a school closer to home. Notre Dame coaches and officials were sympathetic, but they couldn't simply release Vanderdoes without drawing the ire of hundreds of other schools. (Florida State coach Jimbo Fisher also faces the same backlash if he releases unhappy signee Matthew Thomas, but we'll discuss that situation shortly.) Instead, Vanderdoes will have to sit out a year in Westwood. And not simply a redshirt year. He'll lose one of his four years of athletic eligibility. For that, thank the NLI. What makes this so interesting is that Vanderdoes didn't have to sign the NLI at all. He could have received an athletic scholarship without signing away all of his leverage. Unfortunately, most top recruits aren't aware that they don't have to sign a contract tilted ludicrously in favor of the schools. The first version of the NLI was crafted with the noblest intentions in 1964 by Texas Tech faculty athletic representative William Davis, who hoped to standardize the process by which recruits and schools entered into scholarship agreements. Before, conferences had their own letters of intent. For example, a football recruit could sign with Auburn -- stopping all other SEC schools from recruiting him -- but all the schools of the Big Ten could continue recruiting the player. Needless to say, things got pretty messy. The NLI program -- which is run by the Collegiate Commissioners Association and administered by the NCAA -- made the process more uniform. It also tilted the scales heavily toward the schools. When major college sports brought in a pittance and most schools scraped together scholarship money, that was fine. Now that the top schools have chosen to turn football and men's basketball into multibillion-dollar businesses, it seems only fair that recruits better understand exactly what they are signing.
? The player cannot be recruited by any other school.
? The player must enroll at the school for at least a year, or he/she must give up 25 percent of college athletic eligibility.
? All these penalties stay in effect even if the school fires the head coach or the head coach leaves (usually basketball) or the assistant coach who recruited the player takes a new job within a week of National Signing Day (usually football).
? Other schools aren't allowed to recruit him. Sure, the NLI contains some language about guaranteeing an athletic scholarship, but that depends on two factors. First, the student must be admitted to the school. This seems logical enough, but if a school is asking the player to sign away all his leverage, the least the school can do is guarantee a seat in the freshman class. Second, the school must have enough available scholarships under NCAA rules. In 2010, LSU had to tell lineman Elliott Porter -- who was already attending classes in Baton Rouge -- that there wasn't room for him because the school had signed too many football players. Porter wound up going to Kentucky before returning to LSU as a walk-on, which seems an awfully expensive penalty for LSU's screw-up. But the NLI offered no protection to Porter. When most contracts get broken, they provide for a penalty for the guilty party or remuneration for the aggrieved party. If a player breaks the deal, his penalty is a 25 percent reduction in eligibility. If a school breaks the deal, its penalty is ... nothing. Simple: leverage, or lack thereof. Many of the best men's basketball prospects elect not to sign the NLI. They sign an athletic aid agreement and retain their rights to be recruited. Basketball coaches accept this because they've spent so much time and money recruiting the player, and losing one of a two- or three-man class could be crippling. Football coaches, who sign 15-25 players a year and have 85 scholarship players on their rosters, have more room to dig in their heels. If a player says in January that he won't be signing an NLI, then a coach can simply drop that player and grab the next one on his board. That is, unless that player is special and the coach feels he must have him to succeed. That's where Vanderdoes and Thomas, the Miami linebacker currently fighting with Florida State, made a mistake. Notre Dame or Florida State might not have signed those players had they declined to sign the NLI, but plenty of quality programs would have. That isn't the case for the 20th guy in the East Carolina signing class, but it is for the recruits at the top of the food chain. Ole Miss was not going to say no to Loganville, Ga., defensive end Robert Nkemdiche if he didn't want to sign an NLI. Rivals.com had Vanderdoes and Thomas ranked among the top 21 recruits in the nation. Some school would have been willing to roll the dice and offer a scholarship with no return guarantee. Those players' talent gave them that leverage, but they elected not to use it. This is not entirely their fault. The entire recruiting system is built on the premise that the schools know and make the rules and then enforce them on people who have little or no familiarity with the process. Notre Dame and Florida State are simply acting in their best interests here. The NLI is extremely useful to them, and if they elect not to enforce it, then they open it up to a legal challenge that could have it declared null and void forever. That's why Notre Dame coach Brian Kelly and Florida State coach Fisher have been under significant pressure from other schools to enforce the terms of the NLI on these players. Kelly gave Vanderdoes a break, lifting the recruiting ban to allow him to seek other options. Fisher hasn't done that for Thomas specifically because the issue for the Seminoles is a belief in Tallahassee that someone representing another institution that utilizes the NLI (USC) has continued to recruit Thomas in spite of the ban. What can Thomas do? He can wait four years for the NLI to expire and then have full eligibility. He can attend another school and sit out a year before playing. Or he can go to a junior college, redshirt one year, play one year, obtain a two-year degree and play three years at the school of his choice. Of course, that school might also shove an NLI in his hand. The smartest move for players with dozens of scholarship offers is to refuse to sign. If every player in the Rivals100 for the class of 2014 refused to sign an NLI, top-tier schools would be forced to make some difficult choices. First, they'd have to decide if they wanted to allow the best players in the country to simply go elsewhere. (They wouldn't allow that much talent to trickle down to the have-not schools -- which would happily agree to the players' terms.) Then, with their precious document neutered, would schools stick by the NLI, or would they adjust it to make it a little more reasonable? We'll only know if the top prospects decline to sign the worst contract in American sports and demand something better.